From initials to "happy birthday" to an inspirational quote, the custom possibilities are endless—and comfy. Make their next set of socks stitch perfect. 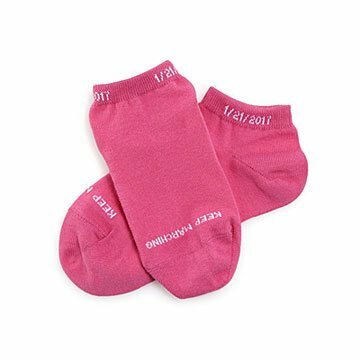 These extra comfy Supima™ cotton pairs are knit with a personal message of your choosing. Keep it simple (and avoid laundry day mix-ups) with initials at the ankle and full name across the top, wish someone special a happy birthday, or keep a friend on their toes with an inside joke. The possibilities are endless—as long as they fit within eight characters at the ankle and twenty characters across the toes. Made to order in Phnom Penh, Cambodia. My daughter uses these every day and easy to sort from other family members' socks as they are personalized! so practical when living with a lot of people. Easy identification of a commonly worn item. Such a cool and personal gift for your feet!